There are feature races in Melbourne, Brisbane and Adelaide on Saturday and Ballymore will be represented in all three cities with ten horses heading to Flemington, Doomben and Mornington. Our big day kicks off close to home with Araldo Junior lining up in the third event at Flemington, the Might And Power Handicap. Nicely primed third up for the 2000m contest, Araldo Junior was terrific when third at Warrnambool last time out and his work since, according to Michael Moroney, "has been superb." "He is going very well and he has improved since that run. We have changed his plate as he was feeling his feet a bit and that should really help him." Topweight in the fifth race, the Les Carlyon Handicap, is Loyalty Man who has been racing in great heart of late. "He strikes the right race again," Moroney enthused, noting that from barrier 2 the son of Fastnet Rock may be able to go forward. "The does not seem to be a lot of speed in the race and he looks hard to beat." Right down at the bottom of the field as no.17 in the Listed Andrew Ramsden Stakes (named in honour of one of our great supporters of the past) is Space who was unplaced in the same race last year having worked hard from a wide gate. He has unfortunately again drawn less than ideally in 11 but has the services of Patrick Moloney and his recent form reads well. "He ended up four wide in a six horse field in Adelaide last start but he was really finishing off strongly late," Moroney noted. "We think the 3200m will suit him now, it is just a matter of if he is good enough in what looks to be a handy field of stayers." Garud is the last of our Flemington runners, due to take his place in the final event of the day, the Better Loosen Up Handicap. Having his first run since late last year, the son of High Chaparral has "struck a strong race" but he has been shaping well at home and his first up record is a consistent one. "He is better over a bit longer but he has been stakes placed fresh," Moroney said, adding that "any rain about would help." Up to Doomben where we have three lovely horses in action for the winter carnival, kicking off with Serenade in the Listed Bright Shadow Handicap. "She travelled up to Brisbane really well and we have been very happy with her, she has eaten up and done everything right." "She will need a bit of luck in running from an outside gate but she is racing well and was a bit unlucky in Adelaide last start." Another talented three-year-old filly in Alaskan Rose (pictured) lines up in the Gr.2 The Roses, a race we won six years ago with Marheta. "She has a really tricky gate (16) and she is going to need all the luck in the world," Moroney rued. "But if things go her way she will be hard to beat, it will just depend on where she is able to slot in and what sort of pace the race is run in." "They can get into two divisions at Doomben and if she ends up too far back in a slowly run race it will be hard for her to make ground." Also tackling Group company is Tivaci who has fared better in the barrier draw, due to jump from gate four in the Fred Best Classic. "We have been really happy with him," Moroney said, noting that the Colin Hayes Stakes winner trialled well at Randwick enroute to Brisbane. "Christian Reith rode him in the trial and was impressed by the way he finished off. This is a good race but he is a horse we have always thought could be a Group One horse." "There are a few others in the same boat so it should prove to be an interesting race." Our Morphettville day begins with Black Tomahawk in the second race, the Listed Port Adelaide Cup. Not really suited by the way in which the Warrnambool Cup was run, he was nevertheless not disgraced and a firmer surface is going to suit. "He strips fitter and his previous run at Caulfield was good, he should prove very competitive." Also racing over 2500m - in the Gr.3 South Australian Oaks (Fillies Classic) - is Vandancer whose form is very good on paper though Moroney expressed concerns that she may be heading towards the end of her consistent preparation. 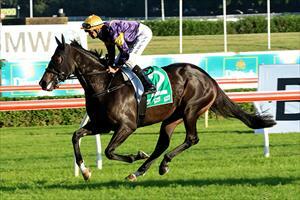 "But she is a smart filly who is bred to stay," he said of the Savabeel three-year-old. Taking on reigning Melbourne Cup hero Prince Of Penzance in the Gr.3 R.A Lee Stakes is Rhythm To Spare who strips fitter for his last two runs - suited back up to his pet trip, the 1600m. A six times winner at the distance, Rhythm To Spare has been just even at two runs this time in but Moroney is "hoping that a trip away will turn him on." "He was a bit unlucky at his last start, held up for a run when they sprinted, and he has improved - his work has been good." Stakes twice having been successful in the race two years ago. Racing heads to Bendigo on Sunday where we have three runners beginning with debutant Wantit in the opening event, a 1400m maiden. "He is a nice big horse but a bit of a time job," Moroney said. "Whatever he shows this time in he will improve on." Later in the day Strike Force is second up in the 1300m handicap and he is looking at atone for his first up defeat. "We were a bit surprised he got beaten that day," Moroney said, "but the horse who beat him (Cool Cool World) has won again since so the form looks good." "He has improved and will be hard to beat." Our final runner on a busy weekend is Rising Stock in the Bendigo Sportsman's Handicap and with him it is just a matter of him putting his best hoof forward. "His form looks consistent on paper but he has thrown a couple of races away," said Moroney. "He never really travelled last time out, maybe it was just the synthetic, but Jake (Noonan) said that he felt like he was looking further so we have stepped him up to the 1600m... and he is bred for it."